Spring has arrived in Slovenia. In the shade the air hints of a damp cold refrigerator, but the sun is so toasty that we shed layers searching for bare skin to sizzle in the sunrays. Each day more trees are blooming and soon the wild cherry tree out side our balcony will be exploding in white. The magnolia trees are giant pink ruffles next to the florescent feathery mimosa blossoms with crocuses underneath. Pansies and daffodils tilt their faces to the sunshine and shimmer in glowing light in the breeze. 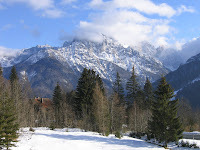 Panovec is a wooded area close to the center of Nova Gorica. It has paths and dirt roads throughout the woods for hiking. In the lowlands wild crocuses speckle the grass between the toes of the trees where the fairies have left pink, purple, and white flowers. The snowdrops nod their bonnets, primroses clutch the earth on the southern slopes and white flowers that look like an anemones peak out of the carpet of leaves. The kos with it’s ink black body and orange beak sings arias from the tops of the trees while the little birds that look like a blend of chickadee and goldfinch add a pop tune closer to the ground. The farmers have come alive too. The clear plastic protecting the salad crops is coming off, piles of manure delivered from the dairy farms in the high lands mark the ends of the gardens and the tractors are digging deep into the earth trading warm soil for the cool damp dirt. 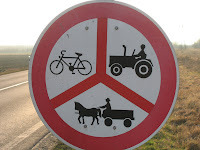 Small old tractors serve as modern horses pulling the hand led plow guided by a person walking behind. It is also time to trim the vines. All over the steep hillsides people are working on the terraced land cutting the old growth so there will be grapes to harvest this year. The techniques of trimming are different with each grower; one vine from the trunk with 10-12 eyes curled and tied down or 2 vines with 10-12 eyes but not tied down, or the 3-3-3 system we were using in Joško’s vineyard; 3 short vines with only 3 eyes each, plus 3 nubs with only one eye as growth for the next year. Last year I was only willing to serve as the puller of the old vines for fear that I would trim something wrong. This year I boldly learned to see the growth of the vine, discern the old and unhealthy vines to be cut away revealing the strongest and healthiest left to nurture the 2007 grape crop. The hillsides are still with concentration with the occasional sound of a chain saw cutting posts for new plantings, and the slow dripping of the tears from the vines of the new cuttings. The vineyards twist around the hillsides and everyone knows which section belongs to whom. Some of the current property boundaries were established by Archduchess Maria Theresia [1717-1780] of Austria, Holy Roman Empress and Queen of Hungary and Bohemia in the 1750’s. She brought unity to the Hapsburg monarchy and reform for the serfs living on the land in the empire. The serfs under feudalism leased specific land from a landowner, and the family passed from generation to generation the requirement to work this land in exchange for protection and care in time of famine. The understanding during this time of Enlightened Absolutism was that the strength of the monarchy was no longer determined by the size of the army and the amount of land, but by the health, well-being and productivity of the people. Maria Theresia imposed strict restrictions as to the treatment of the peasants by the landlords, and established that the work dues paid by the serfs become rent to inspire greater efficiency in the workers. The serfs had their own land of open fields for production, wood lots for fuel and building materials, and uplands for grazing the animals. These feudal lands have been inherited for generations and the style of farming small strips of land continues to this day. Winter holiday from school arrives just as the kurent are scaring away the winter in their furry costumes with bells ringing around their waists. Children and their parents dress in costumes and parade around town throwing confetti for the pust celebration and carnival is in the air. 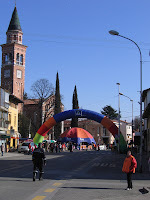 In our town of Šempeter, the downtown area is closed on Saturday before Lent and the participants and the viewers gather under a sunny sky near the inflatable decorations and tents. The odd combination of balloons, krafa [a jelly filled donut sprinkled with powdered sugar], cotton candy, popcorn and beer are sold on the streets as people gather just to be out and about and together. The parade consists of a marching band, costumed walkers, social commentary banners [that we can not understand] and a reproduction trolley built by the firemen at the firehouse across the street from us. Every night for weeks we could hear the pounding, the music playing loudly, the struggle to take tires off an old car as the volunteers had way too much fun building a workable trolley that held people dressed in historic dress. 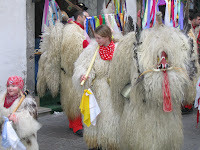 We attend the biggest Slovenian pust celebration, Kurentovanje, in Ptuji on the Sunday before Lent. Thousands of people migrate to this river town and line the streets watching for the 400 international kurenti weaving through the medieval village in a 2-hour parade. 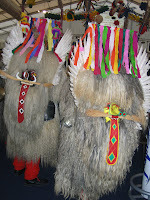 The kurent are furry creatures made of sheepskin with horns, long red tongues that hang to their chests, cowbells hanging from their waists and headgear decorated with colorful streamers and horse tail. Traditionally the kurent paraded from house to house bouncing up and down ringing the bells to scare away evil and winter. They carry large pinchers used for catching girls and courting gestures were disguised within the general frivolity. 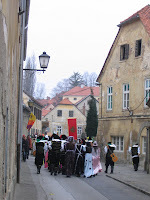 The parade was begun in Ptuji, the oldest city in Slovenija, in 1939 to protect the traditions unique to this area. This year kurenti came from many Balkan countries that share the same ancient traditions. Parking was free, very few vendors were hawking wares and all the shops were closed, as is tradition on Sunday. It was refreshing to see that the motivation of the event is to provide a community experience and not to use it only to make more money. Following the parade in Eastern Slovenija we head further east and north to Budapest. This is the first time we have been to Hungary [Magyar Köztásaság] and the trip across the border is like traveling into another world. The villages are made up of houses built along the edge of the road. The front wall facing the street is only the size of a wall with 2 windows and commonly single story, but the house continues long and perpendicular to the street connected to the barn and other out buildings. The streets are without curbs and a gate often closes the entrances into the yard. The grayness of the day and the dirt from the winter contributed to the sense of regimented desolateness in the fringed structures along the road. New highways are being built to connect the capital cities of the EU countries and where the superhighway was finished we were often the only car on the road. It is an eerie feeling to be so alone on a beautiful state of the art road as if it was built in the hope that people will want to travel there. 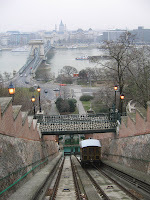 Buda and Pest are marvelous cities separated by the Danube River and linked as one by majestic bridges. 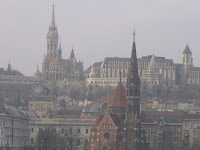 The Royal Palace, St. Mátyás church, the Liberation monument look down to the plains of Pest from the castle district. A funicular takes us up along the ridge where we walk among history beginning with the Celts from around 400BC. Other visitors have been Romans in AD 100, Attila the Hun, the Goths, the Longobards, the Avars, the Magyars [who arrived from the Ural mountains around 896], the Turks, Hapsburgs, the Germans, the Russians and the Communists. Labyrinths below the castle district have been places of refuge from vicious invaders since prehistory and now are mysterious channels of caves designed to inspire visitors to seek a mystical journey. 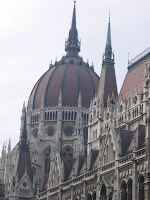 Pest proudly displays a highly ornamented Parliament building, pedestrian streets with fashionable shops, courtyards, towering ornate buildings, museums, opera houses, universities and a luscious giant closed market. We spend our 2 days walking all over both of the cities gawking at the mosaic decorations, the ceramic roof tiles, the giant sculptures holding up the buildings, the columns, turrets, domes. Riding the old tram around the city was better than any amusement park ride and we are convinced that we are the only people who ever pay for public transportation in this part of Europe, since no one ever comes to validate our ticket. The city is very people friendly, clean and quiet. The language is soft with out a harsh resonance and even in places with large crowds the sounds are gentle. 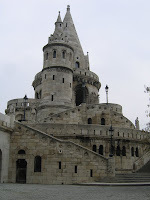 Hungarian is not an indo-European language and is closer to Estonian and Finnish than the Germanic or Balkan languages. Fortunately everyone spoke English so that we did not have to decipher Kozöponti Vásárcsarnok as the Central Market. [We are having a hard enough time learning Slovene; we simply could not tackle Hungarian for 2 days.] The food is marvelous and not expensive. We are eating gourmet meals with excellent regional wines at every restaurant, and snacking on the local specialty lángos [deep fried bread with various toppings] and luscious sweets from the market. On our way out of town and heading to Graz, Austria we stop for a picnic at Szobor Park where all the enormous statues from the Communist years have been moved. 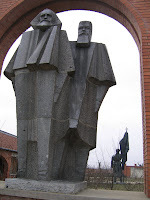 Cubist style statues of Marx and Engels guard one side of the entrance with Lenin on the other. 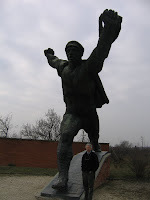 41Communist monuments live in this walled garden, many celebrating the Hungarian worker, heroes of the 1919 revolution lead by Béla Kun and the soldiers who fought the wars. The park is far out of town; the only statue outside of the walls is the remaining boots of a gigantic statue that was destroyed during the liberation, and it sets the tone that this period in history is not to be remembered or celebrated, but rather hidden and forgotten. It was interesting to see the differences in topography on our way to Austria. The Slovene countryside is divided into small farm plots that are distinguished by a variety of crops. Villages speckle the landscape with church steeples stretching to the sky and it seems that those who work the fields live near by. But in Hungary the fields are enormous, planted in a single crop of vibrant green winter wheat or earth waiting for the new crop. For as far as we can see there are no buildings of any kind; no barns, houses, out buildings, only cultivated fields. Our third day is spent in Graz, Austria. 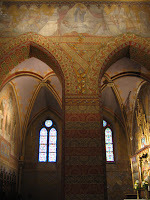 Many of my singer friends have traveled to Graz to study singing at the American Institute of Musical Studies. Everyone had beautiful things to say about the city so it seemed like a good choice on this trip to check it off the list of “places to see.” Graz is the second largest city in Austria and the core of the city is a park near the river. We walked in the early morning mist up the castle hill to the only thing remaining when the castle was destroyed by Napoleon. From the clock tower the moisture rising from the river and the sun warming the winter chill blanketed the city in a shroud of mist and hushed the stirring residents as they began their day. We only had the early morning to spend in Graz, but Bob bought a beautiful corduroy Tyrolean sport coat in a shop along the river that sold only clothes in the traditional styles. He looks pretty gorgeous! 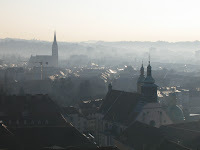 Our time was cut short because we needed to meet nephew Matthew coming by train to Villach, but Graz is a city we would like to visit again with more time.